H i ! It's been awhile since I've hopped on here. I wanted to share some of our favorites that are helping us get back into our school routine. I just took Nash to preschool and took a little time for myself to grab a coffee, take a walk and then go Kroger shopping a l o n e. That's huge. All those things happened in one day, really!! Ok, lets get started with our favorites. I let the boys pick out a couple items this year along with their backpacks. H&M always has good prices and cute boy clothes. I found these shorts and this t-shirt to match for Callen. Blake is really into baseball, so this tee from Amazon was "A-Ok" with him. Then, we hit up Zappos for some cute shoes like these velcro for Nash and these for Callen, who is learning to tie his shoes. This cute basket from Target would be great for the boys to toss their hoodies, hats or backpacks to keep them off the floor, so it's on my list. Another way to "keep things off the floor" are these wooden hooks I'm adding to our mudroom. I have them here in our living room and I love them. However, right now it looks like a baseball shrine because of Mr. Blake and adding that third backpack in our house seems like so much more stuff. So, we're getting more hooks. 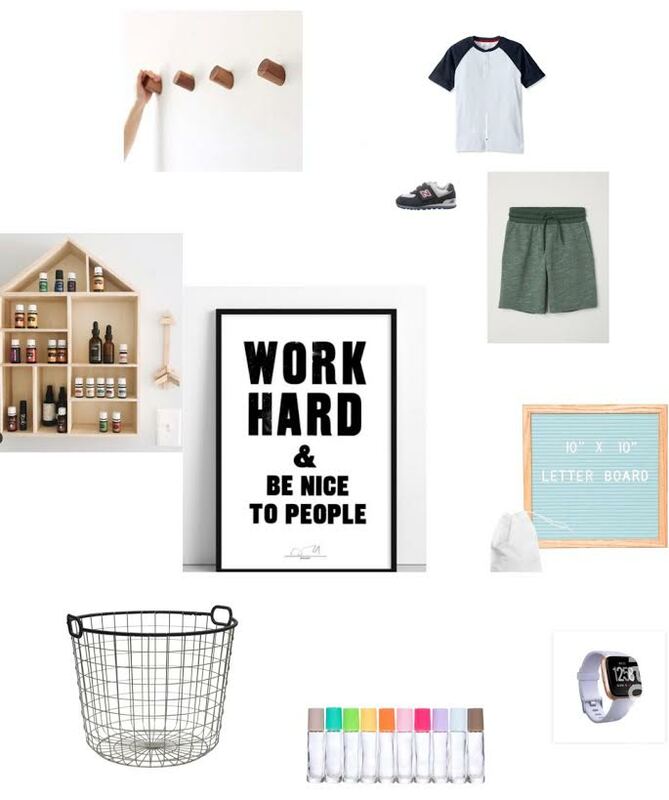 Let's not forget this memo board seen all over the internet for /back to school/ pics. Also, great for milestones with little ones, messages for the school kiddos or change it up with sweet holiday messages. A print that I can't get enough of is this one. Here is a cheaper option and you can purchase an oversized IKEA frame to put it in. Now, lets talk oils. We've been using Young Living oils for over a year now. Thats our little house of oils up there! We use them every single day for either >> sleep, anxious little minds, upset bellies, facial moisturizer, immunity booster, cleaning and positive vibes. They have helped us stay out of the Dr.'s office and cut down the time we are sick >> in half. I read something about 'modern moms' - (is that like cool moms ;-) using oils today and how our society is used to just getting sick, going to the Dr., picking up our prescription and we attack the sickness AFTER we are diagnosed. With oils you can prepare yourself for sickness now. Be healthy now! Good point! I really don't like to see my kiddos sick. Who does?!? So, we make rollers with thieves, lemon, purification and grapeseed oil and rub them on the bottom of the kiddos feet on most days. This acts as a barrier to germs and keeps their little immune systems boosted throughout the day. I also love diffusing thieves and orange oils in our diffuser to keep our home germ free and it smell like Christmas! I have a ton more ways we use them and I keep learning more everyday. Here are some oil rollers I'm getting ready to fill up so that we are prepared. Let me know if you want more info on oils, if you haven't taken the plunge yet! One last item is this FitBit. I like to ride my bike and take a walk here and there. One way to keep me motivated and know my progress is thru my fitbit. It also gives me the ability to put my phone down and tend to my boys. With my watch on I can see my messages and see when someone is calling so I can stay outside and PLAY. Ok..thats it. Cheers to a fab school year!